www.sapanasansar.com: Thank you for your support to ECDC Nepal ! Thank you for your support to ECDC Nepal ! Thank you very much for all your support. We were able to successfully raise and send N Rs. 3,62,924.00 to ECDC Nepal. Pushpa Bashnet, the founder of ECDC Nepal and her team have been actively working for the welfare of the innocent children living in jail with their parents who are serving time for their crimes. Pushpa and her team are now parents for more then 40 innocent kids. Your support has been always encouraging Pushpa and her team for creating a home for those innocent children, whom, now she shelter, nourish, and educate for the better future of the kids and the world. sapanasansar.com and GrowingBeyondBars would like to thank ANMN , Empower Nepal Foundation, the Nepalese community around the globe and the friends of the Nepalese community around the globe for participating on this fundraiser. Click here to view the complete donors list. 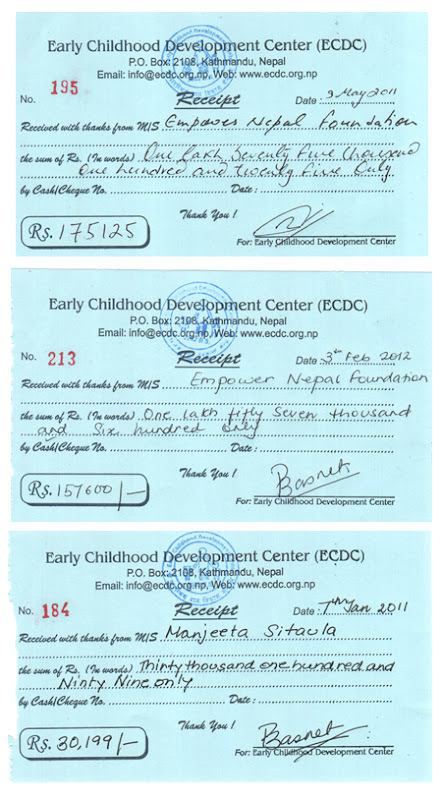 Click here to see the receipt from ECDC Nepal. If you are intereseted to volunteer or support ECDC Nepal, please visit ecdc.org.np and contact Pushpa Bashnet and her team.